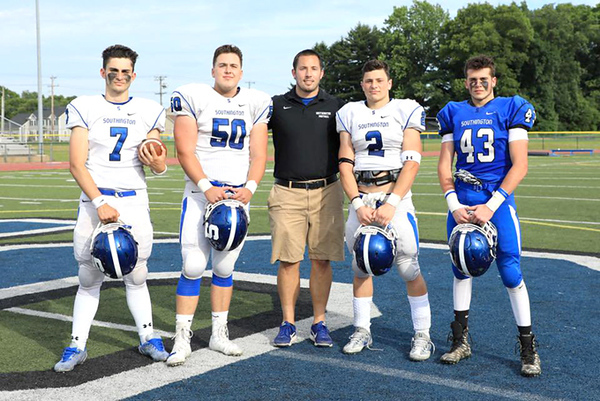 SOUTHINGTON - When Southington High School senior Owen Bouchard received a text from football head coach Mike Drury last week telling him and the rest of the football captains to wear their jerseys to school the next day, Bouchard figured it was just a local newspaper doing a story on the Blue Knights. Turns out, there was a story to be captured, but not of the team as a whole. That moment was all for Bouchard, who began to figure it out when he arrived to school sporting his football jersey, only to find his fellow captains in normal street clothes. Doors have already opened for Bouchard, who aspires to become an orthopedic surgeon after college. First, the offensive lineman will replace his shoulder pads with scrubs as he begins studying exercise science at UConn next fall. Thanks to his time with the Blue Knights, Bouchard already has an extra step forward in terms of his career path. One of his coaches at Southington referred Bouchard to his orthopedic surgeon, who allowed Bouchard to sit in on multiple surgeries to get a sense of what his dream job entails. Bouchard, who already had begun to show interest in the profession once he began lifting in high school, was sold on the job almost immediately. For a high school senior who spends his time lifting, playing football, shadowing surgeries and volunteering at his church in the summer, there’s little free time for Bouchard to do what others would consider to be activities for a typical high schooler. Bouchard has no regrets, knowing his cramped schedule will only make things wide open for him in the future, with even some national awards to keep him going along the way. Posted in New Britain Herald, Southington on Wednesday, 10 April 2019 21:17. Updated: Wednesday, 10 April 2019 21:19.